An afternoon spent rinsing, peeling, chopping, and roasting vegetables yields 6+ different beautiful, nourishing, and delicious soup combinations for cool fall days to come. 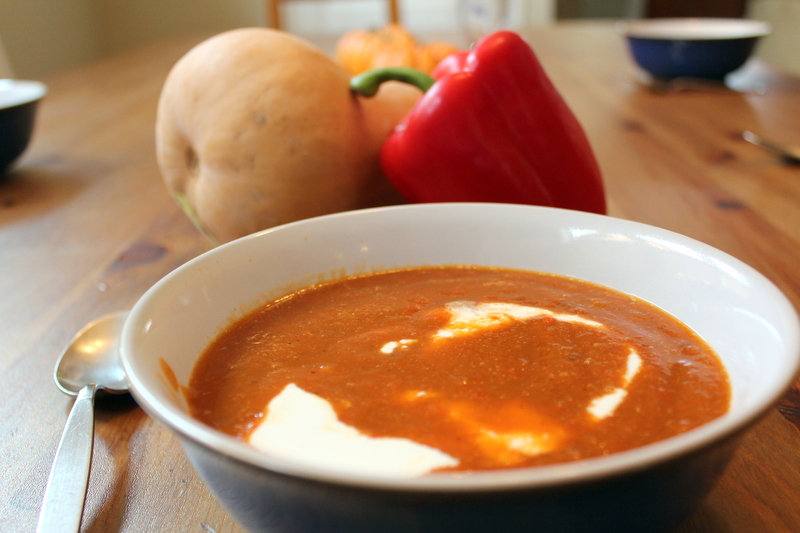 This method is outlined with video as a bonus unit in our Freezer Cooking Class, but using the directions to follow anyone can have the rewarding experience of turning a pile of vegetables into instant soups in just an hour or two. 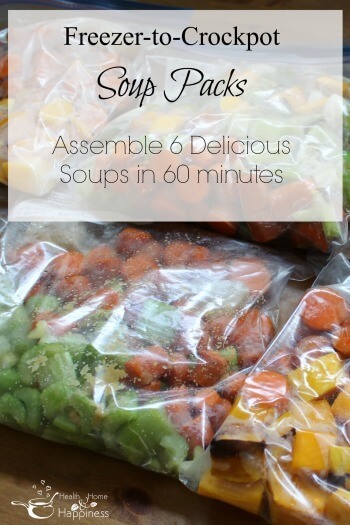 Spend a couple hours one rainy morning and put together a bunch of inexpensive instant soup packs for the freezer. Reduce stock to 2-3 quarts. Once cooled to room temp, add gelatin and mix in with a whisk or fork. Allow gelatin to absorb liquid. Preheat oven to 425* If you have a convection oven, use the convection setting. Rinse, deseed, and chop peppers. Place chopped onions and peppers on a baking sheet, sprinkle with about 1 tablespoon sea salt. Roast onions and peppers in the oven. Once gelatin has absorbed the stock and is thick, heat over medium-low heat for 15 minutes, or until melted. Continue rinsing, peeling, and chopping other vegetables. 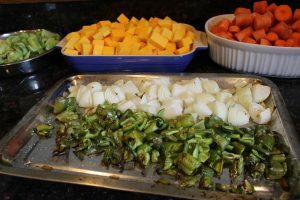 Roast the rest of the vegetables in shallow pans or dishes in the same manner as the onions and peppers. Roast with similar colors together. 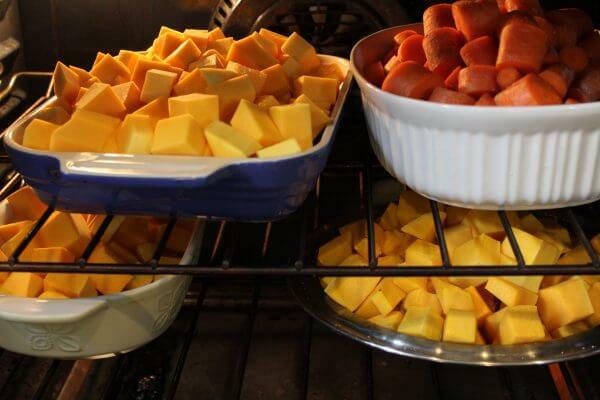 Once vegetables are starting to brown at the edges (about 20 minutes of roasting), remove from oven and put new vegetables in until all vegetables have been roasted. Once gelatin/broth mixture is solidified, cut into 2"x2" squares. Transfer vegetables to bags in desired amounts and combinations and add 1 tablespoon of salt and 1/2-1 teaspoon of 2-3 of the seasonings, in different combinations. Add one-two broth cubes to each bag. Fill a saucepan, stock pot, or crock pot 1/2 to 3/4 full with vegetables from the soup pack. Cover frozen vegetables with filtered water. Slow cooker: Cook on low for 8-10 hours, high for 4-6. Stove top: Cook over medium heat, covered, until brought to a simmer. Reduce heat to low and cook an additional 30 minutes, until heated through. More detail for the broth cubes can be found here. Top with coconut milk after pureeing. After cooking, do not puree. Add 2 cups cooked, diced chicken during the last 20 minutes of cooking. Cook, then puree with an immersion blender. Top with a sprinkle of paprika before serving. Use in-season inexpensive vegetables for substantial cost savings. Sharpen your knives! Hopefully your knives came with a sharpener. If cutting up the veggies seems tedious, take 30 seconds to sharpen your knife and the job will go so much faster. Different flavors can be made by using different seasonings, and different combinations of vegetables. If you don’t have a convection oven (convection ovens have a fan to help distribute heat evenly) you may need to turn your trays of vegetables as they roast, especially if you’re cramming your oven full like I did. Store in zip-top bags, write what is included on the label. Top with fresh-pressed olive oil, coconut milk, yogurt, fresh lemon juice, or fresh herbs like snipped chives after serving. Add pre-cooked cubed meat (a great way to extend leftovers!) during the last 20 minutes of cooking for a full meal, or serve as a light lunch, side dish or starter without the meat. If you loved this idea, you’ll love my Freezer Cooking Class, where I teach you how to fill your freezer quickly and easily with nutrient-rich delicious paleo meals in just 4 hours (or less!) Learn more here.